One of the best things about San Juan Island and Friday Harbor is the small town vibe…no stop lights, lots of local stores and the fact that we LOVE the 4th of July! As a matter of fact, we even have a beach on the island called 4th of July Beach! 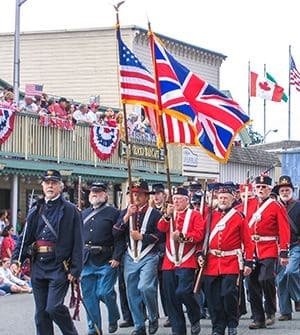 The day starts with a bang (literally) with the sound of cannons booming over the harbor…a wonderful wakeup call and a reminder to head down to Spring Street (Friday Harbor’s main drag) to save your seat for the 4th of July Parade! 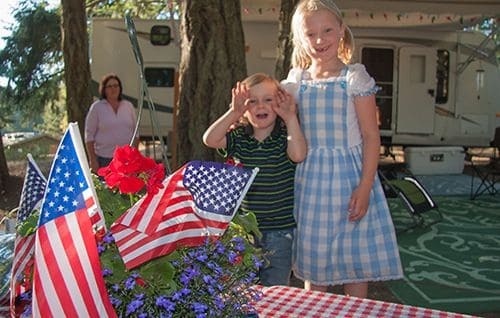 Bring a folding chair or blanket, wear your patriotic duds, and snag some coffee at one of the many java stands on Spring Street while you wait for the 10:30 a.m. parade start. The theme for this year’s parade is “Music of America”, celebrating music through the decades. 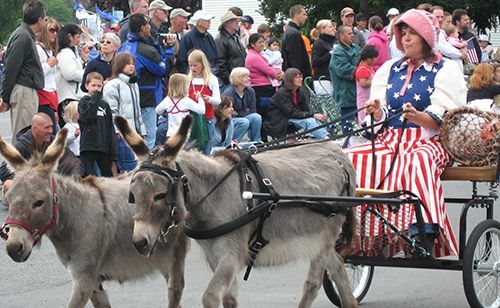 Be prepared for lots of funny floats, candy-throwing, live bands, animals, dancing, historic costumes, and a sea of red, white and blue! After the parade, meander over to the San Juan Historical Museum grounds (405 Price Street), a short walk from the parade route, and celebrate at the Kiwanis Pig War Picnic, (starting at 11:30 a.m.), a historic nod to the border confrontation in 1859 between Britain and the United States, in which the only casualty was a pig. Fittingly, the picnic features lots of barbecue plus local bands, a pie-eating contest, games, and awards for the parade winners. Fun for the whole family that continues until late afternoon! Roche Harbor, at the north end of the island, gets into the act as well with their Old-Fashioned July Fourth. An early morning fun run is followed by Kids Games at the Pool Lawn. Then a not-to-be-missed event – the Doughnut Eating Contest on the West Lawn from 12:30 p.m. – 2:30 p.m. Kids, teens, and adults try to eat from 3 to 7 donuts (that are driven to the contest tables in wheelbarrows) and washed down with milk…a real crowd pleaser! At 3:30 p.m., the Blindfolded Dinghy Race happens followed by a quintessential Northwest event- the Log Rolling Contest at 4:00 p.m. And if you can’t drag yourself back to town late in the day, Roche has fireworks in the marina at 10:30 p.m. Grab a picnic or barbecue your dinner (or make a reservation for dinner at one of the many wonderful Friday Harbor restaurants – see our favorites here at Lakedale’s Favorite Friday Harbor Restaurants). Then head down to the Port of Friday Harbor for lively music by a local group, The Camillions, until the fireworks begin at dusk, usually around 10:00 p.m.
There’s nothing more magical than remembering the glitter of fireworks over the water as you nod off in your comfy Lakedale bed or campsite…wishing July 4th came a little more often.